Mandrem and Ashvem beaches stretch north to south in an almost unbroken line of sand ending at Arambol beach to the far north and Morjim to the south. A (usually) wadeable creek roughly divides Mandrem from Ashvem, and a crucifix in the sand separates Ashvem from neighbouring Morjim. The fine white sand, warm waters and plentiful solitude make these beaches some of Goa's most beautiful. Small shacks dot the shore, and amenities are sparse. It is unlikely to be very long before development creeps across the quiet sands, and the solitude is lost. The waters of these two beaches are shallow and calm, making it a great place for children to swim, though at full moon there are stronger seas. Shacks and restaurants offer refreshments, and there is accommodation available, though the prices are higher than at Arambol beach to the north. 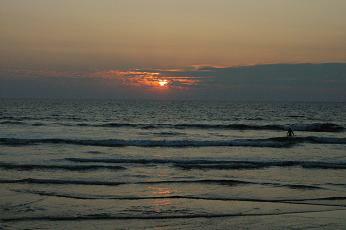 Do you have a favourite beach in Goa? Let other travellers in on what makes your favourite Goa beach so memorable. Buses running to Arambol from Panjim or Mapusa usually take the coastal road past Mandrem and Ashvem. Alight at one of the roadside restaurants and follow the paths/signposts down to the sea, or stop at the small market village of Madlamaz-Mandrem which straddles the main road a little inland. If you continue to Arambol, it is possible to walk south down the shore to reach the two beaches, or arrange a tuk tuk to take you the short distance. Taking a rickshaw or taxi from any town or tourist spot is a feasible option, and prices from Mapusa shouldn't be too high if you are prepared to barter a little over the price. If you are on a scooter or bike, follow the main coastal road over the Chapora river bridge at Siolim, turning right at the market junction by the large Banyan Tree. Take a steep, sharp left and follow the scenic road along the high ground until you see the shore. Ashvem beach accommodation is slightly cheaper than its neigbour. The Coastal Protection Zone banning buildings near the shore has largely been adhered to and so palm and wooden beach huts are the order of the day. At the bottom end, Change Your Mind provides huts for around R.300 (more in peak season). For luxurious options consider Yab Yum Resorts (www.yabyumresorts.com) for around R.3500 a night. In Mandrem some comparitively high priced beach huts (R.600+) at Dunes and Riva Resort nestle around the creek, and they become packed in peak season. Elsewhere is right at the top of the market, but provides stunning accommodation in luxury tents or villas (www.aseascape.com). For food, take a wander past the various huts / shacks and restaurants and see what takes your fancy. Some restaurants on the coastal road above the beaches also do fine food with spectacular views. French-run La Plage on Ashvem beach is a great place to treat yourself to an excellent lunch. If you fancy a change of atmosphere, head north up the beach towards Arambol where you will find a vast range of dining options. Guesthouses, hotels and restaurants will all be able to arrange transport of some sort (i.e. rickshaws / taxis), but if you are a confident rider, hiring a scooter is a great way to get up and down the coast. Try Arambol or Anjuna for bike hire. The small market village of Madlamaz-Mandrem has a supermarket, and nearby Arambol has money changers, tour operators and travel agents as well as internet cafes aplenty. 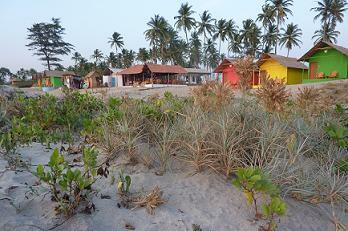 To the south, Morjim beach has several internet cafes. At present the nearest ATM is over the Chapora river in Siolim - so come with cash/traveller's cheques. A petrol pump can be found just north of the road turning towards Arambol. I'd recommend using pumps rather than the petrol sold in water bottles on the road side, since the quality of this fuel is sometimes poor. Fill a full tank, as pumps are few and far between. For a great day trip from here, travel along the coastal road north towards the Maharashtran border and visit Goa's northern tip - the picturesque Terekhol Fort and little known Keri beach.